Two methods by which persons suspected of crime may be tried. In the Inquisitorial method the judges or other officials seek to draw from the suspected person an acknowledgment of guilt by examining him regarding all the circumstances of the crime and about his own past life. They compel him in many cases to give such answers as they wish to hear. Formerly they resorted to the rack or thumbscrew; in some countries even to-day infliction of blows or close confinement is not uncommon. In the Accusatory method, a representative of the common wealth, perhaps of the injured party, frames a written accusation, in which it is set forth that the accused, at a specified time and place, committed a certain offense. This accusation being denied by the accused, or standing controverted by operation of the law, the prosecutor brings his witnesses and other proofs as a plaintiff would do in a civil suit for the recovery of property; and if the guilt of the accused is not established by the witnesses and proofs (evidence being also adduced in defense) to the satisfaction of the judges or jurors, an acquittal follows and the accused goes free. Among those nations that pay little or no regard to the freedom or rights of the individual, the Inquisitorial method is in vogue even at the present day, at least during the preliminary stages of a prosecution; and the admissions of guilt that have been wheedled or extorted from the accused are brought out against him on the final trial, which, in concession to the spirit of the times, is cast into the Accusatory form. Neither Great Britain, with her colonies, nor the United States of America, recognize the Inquisitorial method at any stage; and under the laws that govern the trial of criminals in these countries all confessions or admissions that have been elicited by playing upon the hopes or fears of the criminal are ruled out. The system that the Jewish sages worked out from the written law is altogether Accusatory, like the Anglo-American method. It goes even farther, for it makes no use whatever of admissions or of confessions of guilt, either in or out of court; the Scriptural command, "At the mouth of two witnesses or at the mouth of three witnesses shall the matter be established" (Deut. xix. 15), is understood as excluding the mouth of the accused; and the principle is laid down, "No one can make himself out guilty" (or "wicked"), and it appears often throughout the Talmud. The witnesses can testify only to what they have seen; or, when the offense consists of spoken words, as to what they have heard. Testimony as to the admissions of the accused is inadmissible; for even if they were made in open court, the judges would not listen to them, nor be influenced by them in their decision. The treatise Sanhedrin (chaps. iii.-vi.) deals with criminal procedure in cases in which the punishment is death or exile to the cities of refuge, and incidentally in those cases in which the infliction of forty stripes might be adjudged. The first chapter of the treatise Makkot deals with the proceedings against false witnesses (see Deut. xix. 16-21). 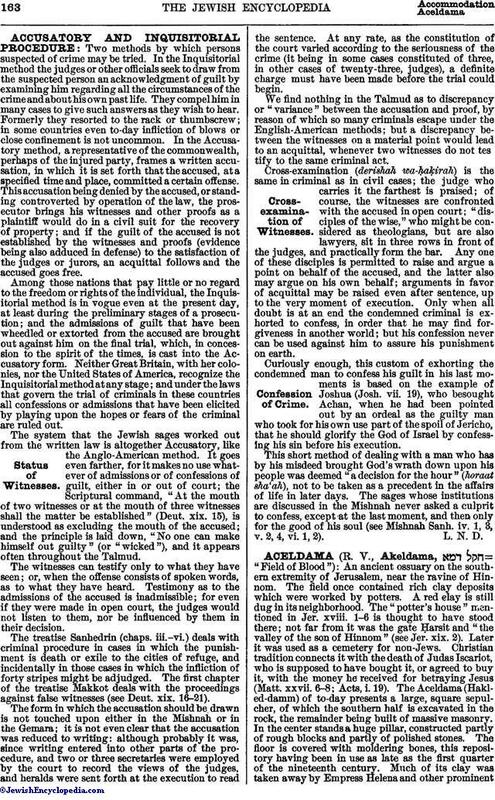 The form in which the accusation should be drawn is not touched upon either in the Mishnah or in the Gemara; it is not even clear that the accusation was reduced to writing: although probably it was, since writing entered into other parts of the procedure, and two or three secretaries were employed by the court to record the views of the judges, and heralds were sent forth at the execution to read the sentence. At any rate, as the constitution of the court varied according to the seriousness of the crime (it being in some cases constituted of three, in other cases of twenty-three, judges), a definite charge must have been made before the trial could begin. We find nothing in the Talmud as to discrepancy or "variance" between the accusation and proof, by reason of which so many criminals escape under the English-American methods; but a discrepancy between the witnesses on a material point would lead to an acquittal, whenever two witnesses do not testify to the same criminal act. Cross-examination (derishah wa-ḥaḲirah) is the same in criminal as in civil cases; the judge who carries it the farthest is praised; of course, the witnesses are confronted with the accused in open court; "disciples of the wise," who might be considered as theologians, but are also lawyers, sit in three rows in front of the judges, and practically form the bar. Any one of these disciples is permitted to raise and argue a point on behalf of the accused, and the latter also may argue on his own behalf; arguments in favor of acquittal may be raised even after sentence, up to the very moment of execution. Only when all doubt is at an end the condemned criminal is exhorted to confess, in order that he may find forgiveness in another world; but his confession never can be used against him to assure his punishment on earth. Curiously enough, this custom of exhorting the condemned man to confess his guilt in his last moments is based on the example of Joshua (Josh. vii. 19), who besought Achan, when he had been pointed out by an ordeal as the guilty man who took for his own use part of the spoil of Jericho, that he should glorify the God of Israel by confessing his sin before his execution. This short method of dealing with a man who has by his misdeed brought God's wrath down upon his people was deemed "a decision for the hour" (horaat sha'ah), not to be taken as a precedent in the affairs of life in later days. The sages whose institutions are discussed in the Mishnah never asked a culprit to confess, except at the last moment, and then only for the good of his soul (see Mishnah Sanh. iv. 1, 3, v. 2, 4, vi. 1, 2).